For years, businesses have relied on the business plan for a number of key business activities such as fundraising, company strategic planning, and revenue modeling. The business plan was the epitome of a corporate Bible. Companies had a plan and stuck to it. Changing the business plan to deviate from the course was a tedious process and frowned upon as investors, board members, and executives had already committed to a particular path for the company. Business plans took months to write and became the cornerstone of everyday activities in the company. While business plans were a useful tool in helping new founders think through every aspect of their business and demonstrate their knowledge of their industry and strategies for growing a successful company within said industry, times have changed and call for different tools to help us grow our businesses today. These trends along with the fact that these markets are much more susceptible to outside influences and can change rapidly have caused entrepreneurs to develop new strategies to react to the landscape. The theory of lean startups, accelerator programs (YCombinator, TechStars, Startup Weekend), Twin Engine Lab’s own lean consulting methodologies, and various tools/resources to help founders, designers, engineers quickly develop and iterate their products for fast growth in the uncertain digital, social, and globalized internet marketplace. Since the landscape can change so rapidly now, it no longer makes sense for entrepreneurs to spend 3 months writing a business plan that could be obsolete in 6 months. Because interaction with and feedback from customers can occur so much more rapidly in the internet era, entrepreneurs have the ability to react much more quickly to customer demands by iterating on code, exploiting different marketing channels, or adapt the functionality of the product to users who have become its core user base. Therefore, Alexander Osterwalder created the Business Model Canvas in his book Business Model Generation. The Business Model Canvas is a one-page document that forces entrepreneurs to concisely and succinctly lay out their business model by focusing on nine key elements of a successful business. This allows entrepreneurs to quickly lay out their initial hypotheses about the market space, the way their product addresses key problems in that space and initial thoughts on revenue sources for the company. Entrepreneurs can then build a Minimum Viable Product to test these assumptions. Once they have gathered metrics from these tests, they can implement what they have learned in the next version of the product and update the business model accordingly. This allows entrepreneurs to more quickly achieve product/market fit, where they can then start to focus on scaling the company and more traditional business planning practices. I recently came across a great post on different types of business model canvases that entrepreneurs can use today to get started. The post was by Laurence McCahill, founder of Spook Studio and Happy Startups, and argued that business modeling should move beyond just money-making activities and focus on things such as people, culture, happiness, and the impact the startup has on the world. He outline the two traditional business models that have been lauded in startup literature as of late, the Business Model Canvas and the Lean Canvas. He then focused on two other non-traditional business model canvases. His post can be found on Medium. 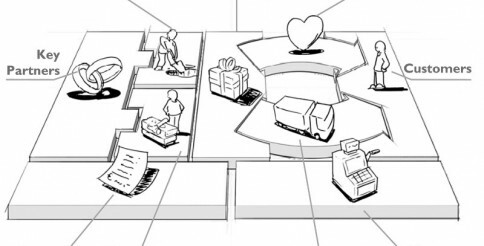 This business model canvas is for traditional startups and small businesses in almost any sector. It helps companies focus on the key activities, partners, and channels it will take for founders to deliver their value proposition to their customer base. It also helps entrepreneurs calculate the monetary and resource costs necessary to do so. Revenue models are also highlighted in this business model. It is highly recommended that non-tech based entrepreneurs start here. Ash Maurya reconfigured Alex’s business model canvas to better fit the lean startup methodology developed by Eric Ries. It focuses more on customers as early adopters and how your solution solves critical problems for them. It utilizes key metrics categories as a way for startups to chart and track early traction with their product. This version of the lean canvas also forces entrepreneurs to focus more heavily on their unfair advantages and unique value proposition against existing alternatives in the often highly-saturated and competitive internet startup market. Laurence McCahill begins talking about the Happy Startup Canvas by saying, “Too much of the startup world focuses on the mechanics of starting a business.Whilst it’s good to move fast and stay lean, it’s time we made our businesses more human and in the process gave them a better chance of survival.” The Happy Startup Canvas focuses on the human elements of a business, the DNA of a startup. Culture is based on people and the human interactions both internally at a startup and externally with customers are at the heart of what make a startup tick. Laurence’s business model canvas makes entrepreneurs focus on these interactions and tease out what makes a startup tick from this angle. This coupled with the technical and business model elements of the lean canvas give the entrepreneur a full overview of the business. These are the many faces of the business model canvas and it is an important tool for entrepreneurs and founders planning out their business.